I finally got around to quilting and binding my into the woods baby quilt. I decided to back it with minky so I didn't use batting. I was very worried about the minky as I have seen so many people talking about how hard it is to work with on the net. I tried a zig-zag binding because I have heard you shouldnt hand sew the binding on baby quilts. I am not really happy with it. I know I need more practice but I still think I would prefer to hand sew my bindings. It really is my favourite step. Now my fox finally has his nose. 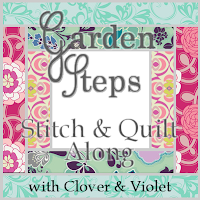 I step I choose to complete after quilting and binding. Dont ask what goes through my head sometimes. I quilted squares around the fox about three inches apart. It is such a warm and cuddly quilt. My 22 year old brother has already tested it out and I am sure he would claim it if it was bigger. Now I have another person on my list of people who need quilts. I love this. Awesome job. Your fox is adorable!! A very cute quilt!